Got this with the new tank but won't be using it. Brand new, includes hose (not sure on the length), assorted plumbing pieces including three 1" slip/slip bulkheads and a Sicce Multi 4000 pump. Sump retails for $319 and pump for about $110. All for $250! Selling a friends tank setup for him. Willing to sell as a complete setup or part out. 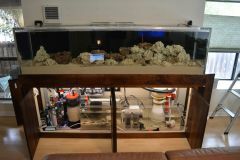 Complete setup (cube tank, PM 20g sump, mag12 return pump, stand, air hydra 26hd, all plumbing) - asking $375 Part out option 60g Cube Reef Ready Rimless tank (stand and plumbing free with tank purchase) - $125 Precision Marine 20g sump - $50 Mag 12 pump - $60 AI Hyrda 26HD LED light fixture and AI rail system - $200 - SOLD Serious buyers only, TEXT preferred to coordinate purchase. 512. 565. 4299. Hello everyone, I know I haven't been posting much lately. I've been pretty busy with work as I'm sure many of you all are. I've finally gotten around to making a sump to supplement the 14G cube we bought back in April of 2016. I just wanted to share a picture and some thoughts on the build. The left side will house the water pump and a minimax biopellet reactor. The next section is going to have some sort of media basket hacked together out of eggcrate/light diffuser. The largest section 2nd from the right is where I've already put some black sand and will put the chaeto for a refugium. The section on the far right will be where the water drains from the main tank. If the skimmer will fit there I'll also put it there, otherwise it's going in the refugium section. I'm also going to put the ATO sensor/fill tube in one of these areas. In my large sump this is in the water drain section of the sump where water comes from the Display Tank. The silicone looks like dookie but it holds just fine. I used some plexiglass sheets from home depot that cost about $4.50 each against the advice of the all knowing internets. You're apparently not supposed to silicone glass to plastic, but I did anyway and it held water just fine when I tested it last night. None of the chambers leaked. Some considerations I'd like to address are that this is going to be sitting on the night stand and it will have a very bright purple tinted refugium light on it at night time. I want to figure out the best way to shield this light so that it doesn't beam the whole room while I'm trying to sleep. It may not be doable but my initial idea to minimize this is to figure out a way to get the light as close to the water as possible to minimize how much of it goes out into the room. I want to avoid painting more than just the back panel black. 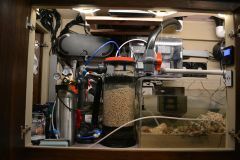 The reason I decided to set up such a small sump is because the room for filtration equipment in the 14G cube is not much. Currently there is only some live rock and a skimmer in the "sump" area of the tank that is separated from the rest of the display. This will also slightly increase the water volume and hopefully make the maintenance of the equipment a bit easier as it will be more accessible without disturbing the main tank. Anyway, this is what I did over the weekend, it's nothing fancy but it will get the job done for the time being. Hello All I am looking for a Sump for my 120g, If anyone is looking to get rid of one please LMK 512-576-9050 Rudy THANKS!!!!!!!!! 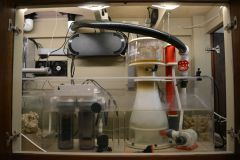 Equipment- Sump, Skimmer, Return Pump, Fuge Light etc. 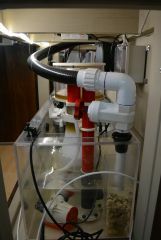 Right side of the sump, GFO & Carbon reactor, protein skimmer, main drain and skimmer controller. The left side of the sump. 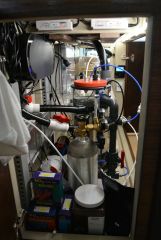 Calcium reactor, return pump, controllers and part of the sump. Well we have a "human frag" on the way so it's time to sell our frag tank. Its a drilled 40g breeder with a 40g sump and custom frag rack I built for it. Stand is also included. Sump also has a bulkhead in case you want to plumb it in to your existing system, but not required. Asking $400 or best offer for the tank, sump, stand and frag rack. 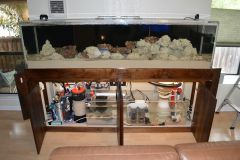 Will also sell separate: 40G drilled breeder tank - $200, Frag Rack $75, 40G sump $125, Reef Octopus NWB 110 Skimmer $125. Thanks! Need a small sump, skimmer, and overflow for my 38 gallon breeder tank. Willing to buy in parts, dimensions needed for all offers. Thanks!